Originally an article in the web magazine Mainsail. The Rocna bower anchor is on all-chain rode. 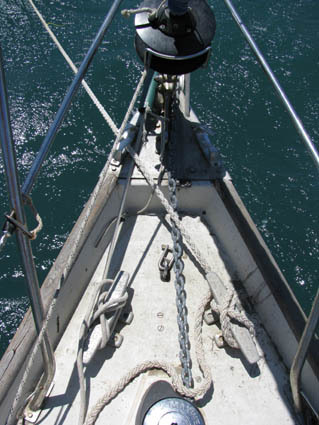 This would normally be cleated as we do not rely on the friction clutch of the windlass to hold the force of the boat. However in this case both bow cleats are occupied. 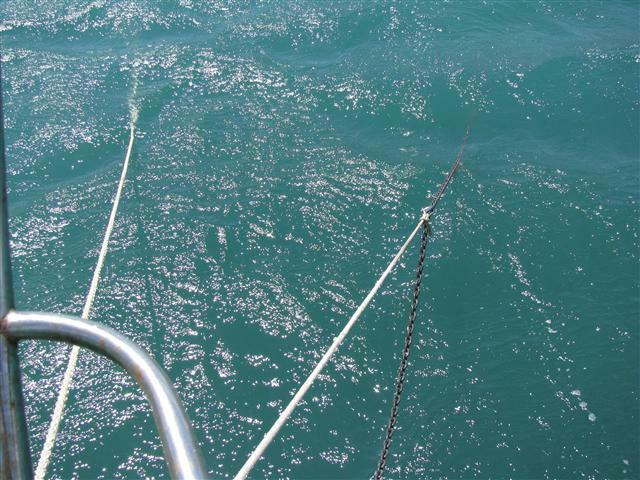 A snubber of about 3-4 metres is hooked to the chain. This is 11 mm nylon doublebraid that we have used for this purpose for more than 20 years. It runs over the port side bow roller, where it is protected from chafe by a length of 1 1/2 inch plastic hose. The Fortress kedge is connected to about 7 metres of chain, the remainder being 16 mm Anchorplait. This was laid to form an angle of around 45 – 60 degrees to the chain. By using the starboard side cleat, chafe is virtually eliminated with the rope rode led to port through a fairlead. We arrive at Galaxhidi, on the Gulf of Corinth, after an excellent sail that included an hour under spinnaker. Into the little port and go stern-to, only to find the new wall so high that our passerelle forms an angle of nearly 45 degrees, far too steep to walk up or down. There is a let-out, though. There is a space where we can go alongside another wall, overcoming the passerelle problem. Within minutes a helpful bystander advises that this is a bad place as the prevailing wind sets up a hammering chop, making sleep virtually impossible. As he speaks the wind begins to blow strongly from the west, bringing with it a dramatic increase in temperature and huge clouds of cement dust from a pile thoughtfully left when the new wall was built. We decide to anchor outside. By motoring as far as possible into the anchorage we are able to settle safely in about 2.5 metres, where we are well sheltered from all directions except south. We initially lay out around 30 metres of chain. The wind is blowing at a minimum of 25 knots, with gusts to about 35 knots. In the anchorage are boats flying French, Dutch, USA and UK flags but people are mostly keeping their heads down. It is Jill’s birthday but we consider it too windy to celebrate ashore and open a tinned haggis. We have unfortunately run out of whisky to accompany it, but Metaxa brandy makes a suitable substitute. Next morning the wind is light and the anchored boats empty, as everybody goes shopping. We all meet at the Internet Cafe to check the weather, a surprise to the owners who don’t normally set up shop until 1100. The forecast is not good: force 6-7 for the next two days at least. We head back, just in time to see the wind go from southerly force 1 to northwesterly force 6 within two minutes. As the gusts increase we decide to put out our kedge at 45 degrees to the bower to make life more comfortable. By 1800 gusts are to more than 40 knots, several boats have dragged but we feel quite secure. We spend the time comparing the motions of a long-keeled Dutch boat, perhaps sheering 45 degrees, with a Bavaria 42 that must be making 180 degrees. He has dragged several times. A Moody 42 on a single anchor is making about 120 degrees and seems to be holding well. With our two anchors (chain plus snubber to the Rocna and Anchorplait to the Fortress) we are doing about the same as the long-keeler, as is another British boat also on two anchors. Later the Dutchman tells us that he has all his chain out, 80 metres in 10 metres depth. We decide to have a barbecue despite the constant challenge to keep the gas lit. By 2200 the wind is lighter and we feel happy to go to bed without keeping an anchor watch. Next morning the wind is again a light southerly and the kedge warp has now twisted around the bower chain, so we decide to take the kedge in. The tangle takes about half an hour to sort out and requires the anchor to be detached from the warp. I row Jill ashore to do a little shopping but return to the boat in case of incident. By the time she returns it is blowing about force 5 from the northwest and I decide to put the kedge out again. After doing this I swim with fins, mask and snorkel to check both anchors. The kedge is not quite perfectly placed, being partly in a hole, but as load comes on the warp it is clearly holding well. The Rocna is a revelation. It has been buried throughout the three days but now the floating line and buoy attached to its head only protrude about 8 inches from the bottom. The line is 3 feet long! By 1700 it is again gusting to 40 knots and a French boat astern has dragged four times since 1200, first on a Claw and then on a Brittany. I download a five-day Grib file that shows the wind here to be westerly at 10 knots, now and for the next few days! The following morning I untangle the kedge warp using a different technique that only takes about 15 minutes. We decide to move downwind to Itea, where we may be able to berth inside if there is space. We arrive to find hundreds of metres of empty wall, where we could have been for the past three days.